Figure 12. 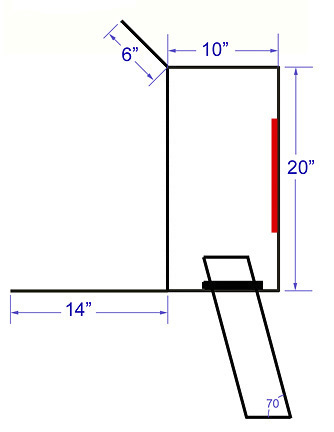 A dimensional diagram (side view) of the homemade darkbox shown in Figure 11. The silver sensitizing tank fits through a hole in the base of the darkbox to allow plates up to 10”x12” to be sensitized in the field. A collar baffles the dropped tank and a red acrylic sheet along the rear wall allows for safelight conditions within the box.